The below artworks are the most important by Isamu Noguchi - that both overview the major creative periods, and highlight the greatest achievements by the artist. Artwork description & Analysis: During the 1920s and 1930s, Noguchi's primary means of financial support came from sculpting portrait busts. At this point he had already studied with Brancusi and had begun to make his own abstract sculptures, many of which merged geometric and organic forms. Although his commissioned portraits were more representational than the majority of his artistic output, these powerful sculptures suggest Noguchi's interest in the abstract, as well as a keen understanding of his material and its properties. The portrait of R. Buckminster Fuller, a likeness of the inventor, theorist and architect who became a life-long friend, is covered in extremely reflective industrial chrome. These high-tech materials created "form without shadow," Noguchi stated, meaning that the reflection itself became a sculptural element. The choice of a modern material for this sculpture was also a reference to Fuller's work with technology. Noguchi was truly an international figure and is also notable for having engaged with leading figures of twentieth-century art, dance, literature and science. It was commented upon during his lifetime that he literally knew everybody of note. Artwork description & Analysis: Considered a major early piece by Noguchi, Death (Lynched figure) testifies to the artist's progressive racial views and strong social commitment. Noguchi modeled the painfully contorted figure, which hangs on rope upon a photograph of African-American George Hughes being lynched above a bonfire, writhing in agony; Hughes was hung in Texas in 1930. The horrifying photograph of Hughes was later reproduced in the Communist magazine, Labor Defender, which is where Noguchi saw it. In terms of form, the sculpture is unusual since Noguchi suspended the figure above the ground on a metal armature. Noguchi created this sculpture for a 1935 exhibition organized by the NAACP to protest the national rise in lynching, and also to pressure President Roosevelt to enact legislation prohibiting such vigilante violence; the President did not. While the sculpture was well received, some critics reacted harshly, revealing their own racism by claiming the artist was not native-born, and in one instance referring to the provocative sculpture as "a little Japanese mistake." The raw emotion and vital energy of Death (Lynched Figure) still remains potent today. Artwork description & Analysis: Considered one of the most innovative and important public works of art from the 1930s, this bold high-relief mural emerged from Noguchi's involvement with the revolutionary world of the Mexican intelligentsia. The sculptural mural was Noguchi's first fully realized public project, and speaks to the interwoven histories and modernisms of Mexico and the U.S. The three-dimensional mural displays the aesthetic and political influence of such Mexican Muralists Diego Rivera and José Clemente Orozco in the choice of the mural format and also, its overt Leftist symbolism - the clenched worker's fist, the tilled field, for examples. It was David Alfaro Siqueiros, the third great Mexican muralist, who inspired Noguchi's use of such innovative art-making materials, such as the unorthodox use of cement, believing modern art must be made using modern means. Noguchi chose to situate his work in an ordinary marketplace so that the common people of Mexico, or the masses, could encounter it during their daily routine. The work's intention was to inspire the dispossessed of Mexico to join in the revolutionary cause. The work's adaption of abstraction is without precedent in Mexican modern art, and was derived more from Noguchi's intimate familiarity with European modernism. Artwork description & Analysis: In the 1940s, Noguchi made a series of interlocking slab sculptures, drawing on Surrealist-inspired biomorphic forms, organic abstractions, traditional Japanese art, and Brancusi's simplified figuration. Biomorphism appeared in much of Noguchi's work - both in free-standing sculptures and furniture designs. Kouros, the largest work of the series and titled after the Greek word for "man," depicts a three-dimensional, fragmented human shape rendered in smooth, interlocking flat surfaces slotted and notched together in a tense balance. The aesthetic roots of Noguchi's sculpture reside in the beginnings of western culture, within ancient Greece and its veneration of the young male both in society and in statuary. The idealized Greek male represented the highest pinnacle of human beauty and perfection within western society up through the 19th and early-20th-century artistic ideals and racial politics. Due to his hybrid identity, Noguchi and other Japanese-Americans suffered overt racism before, during, and after WWII, finding their identities split in half, rather than seen as a united whole. What Noguchi has accomplished with Korous is to challenge the basis of Western art and society, remaking the ideal human form into solids and voids, a whole that can be disassembled and rearranged, just as Noguchi experienced his identity differently in various social and political situations. Artwork description & Analysis: Good design can allow art, including that of the avant-garde, to enter and enhance the lives of everyday people. Noguchi accomplishes this ideal by reducing a table to just three basic elements: two smoothly shaped pieces of wood - unpainted to exploit the natural grain, interlock to create a tripod that supports the glass top. Noguchi eschews all excess ornamentation, letting the true nature of the materials speak while accentuating the elegance of the simple forms. The Noguchi Table conceals nothing, revealing everything about the simplicity of his materials, and harmoniously unites design with functionality. Noguchi originally created this iconic table in 1944, and today it is widely sold by Herman Miller, Inc. It is considered one of the most important works of modern furniture ever designed, and, even more noteworthy, can be found in living rooms, as well as museums, across the world today. Artwork description & Analysis: Noguchi first encountered Japanese gardens during his visits to his father's birth land in the 1930s. By the 1950s he began to design his own unique gardens. The designed garden became a crucial concept for his sculptural landscapes, which he saw as a means to integrate art into social environments. He viewed his work as a "sculpture of spaces," rather than a collection of discrete pieces. Jardin Japonais, for UNESCO headquarters in Paris, was his first major landscape commission. Noguchi felt that gardens should be experienced as nature untouched, so he included elements such as overall organic shapes and lanterns made of natural stone. He arranged the carefully selected Japanese stones by drawing on both Japanese tradition and his own unique design, fusing his skill as a designer with his high regard for the natural world. The fact that Noguchi's patron was the United Nations for a French location speaks to the international reputation, and high regard for the artist and his ability to represent the highest ideals of this international entity. Artwork description & Analysis: In the 1940s, Noguchi produced his first illuminated sculptures, Lunars, having previously explored the idea of sculpting with light. His Lunars demonstrate how the artist continued to draw upon Surrealist-inspired biomorphic shapes, and were comprised of magnesite and light bulbs. 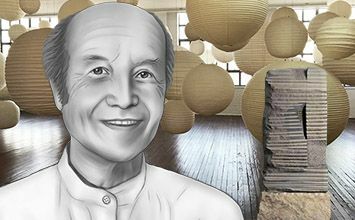 In 1951 Noguchi expanded his basic formula to create his Akari works at the request of the mayor of Gifu, Japan, to modernize the local lantern designs; again, Noguchi united the traditional and the modern. The results have been both exhibited and mass produced since 1955. Noguchi envisioned his Akari (which means "light as illumination") as two sculptures - both the outward form of the sculpture itself and the resulting shapes created by the emitted light. For Noguchi, light was another type of medium in which to work, one that challenged the idea of materiality through its fundamental ethereality, and which radiated both the natural and industrial worlds. Artwork description & Analysis: Noguchi started his Void series in Italy, but he carved the largest, Energy Void of 1971, at his studio on the island of Shikoku, Japan. There he worked primarily in basalt - a local stone -- and granite for the remainder of his career, splitting his time between his studios in the U.S. and Japan. Here, in Energy Void, Noguchi worked with black Swedish granite on a large scale (approximately 6 feet high), having built his studio around the work. In these abstract Void sculptures, Noguchi emphasized the importance of negative space in sculpture by drawing on Zen Buddhist concepts of emptiness. He also found inspiration in laws of physics referring to the cyclical energy flow through all matter, seen here in the piece's continual loop. The piece neither begins nor ends, but rather suggests the timeless flow of energy and of life itself. Artwork description & Analysis: Located within the garden at the Noguchi Museum in New York, The Well demonstrates Noguchi's mastery of natural elements, and the strong presence of a Japanese aesthetic. Noguchi worked with stone his entire life, first learning how to carve while an assistant to Constantin Brancusi. Noguchi produced his final stone sculptures at his studio on Shikoku Island, Japan, where he worked with the local basalt stone. The Well perfectly balances modernism with traditional Japanese stonework, the man made with the natural. The piece unites natural contrasts: the fluidity and transparency of water against the still, solid black stone. Filtered up from below, the water gently skims the surface of The Well; there is a slight indentation on top that pools with water before cascading downwards. Noguchi sensually combines natural elements, creating a work that is both contemplative, but joyous. First published on 05 Jul 2014. Updated and modified regularly.